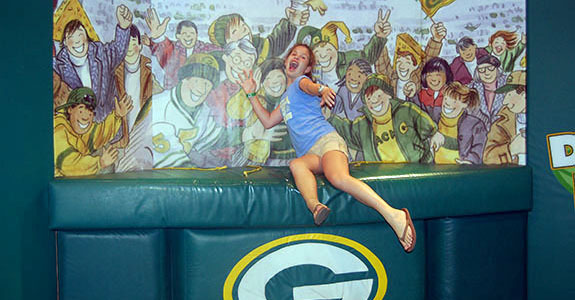 We were so excited to head to Green Bay and visit the storied Lambeau Field home of the Green Bay Packers. This town is all about football and we felt it as we drove through making our way to the stadium wearing our cheese heads of course. 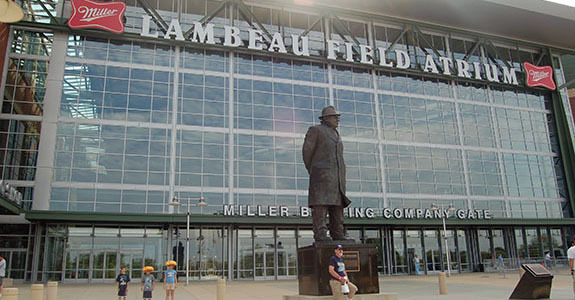 Walking up to the entrance we were greeted by a statue of one of the greatest and most beloved men to ever coach the game, Vince Lombardi. It wasn't football season so the place felt empty, but you could still feel the love between the fans and the team everywhere you looked. We found our way down to the Packers Hall of Fame which isn't just a bunch of photos and trophies and memorabilia. 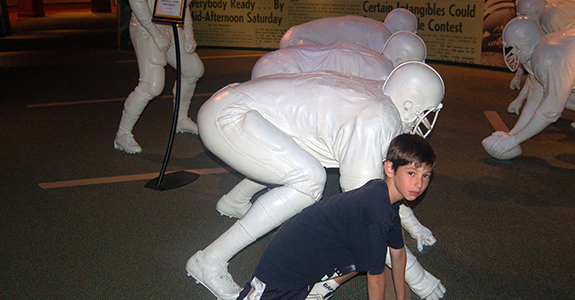 They have all that stuff and it is cool to look at, but they also have some great displays that encourage you to feel what it's like on the gridiron, how the team trains, and even test your own skills. The kids stood next to the "players" on the team and called out imaginary plays. Then they hopped on some bicycles and "trained" with the team. All of us tested our football throwing and kicking skills and then did our own version of the Lambeau Leap, launching ourselves into the stands just like they do after a touchdown. It's Packers tradition. "The greatest accomplishment is not in never falling, but in rising again after you fall"
I explained to the kids that even hough Coach Lombardi was talking about football, his remarks are valuable lessons for life in general and we should keep them in mind when the going gets tough! After a team huddle, we bid farewell to Lambeau Field and headed toward our next stop- Milwaukee.